1. Tarte LipSurgence Lip Tint in Lovely - Jumbo lip pencils are becoming quite a problem for me. Every time I see one, I need to buy it. Case in point: this Tarte pencil. This is my first Tarte Lip Tint but I fell IN LOVE with this color. It was the perfect juicy pink-coral, and feels great on the lips. I actually feel silly that it took me this long to buy one, but it won't be my last. 2. 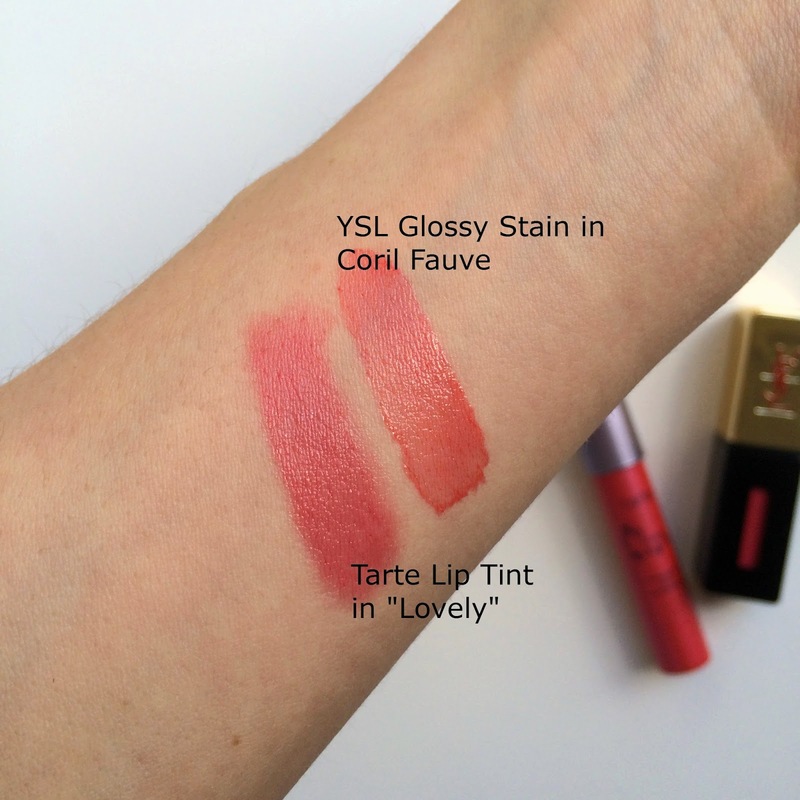 YSL Glossy Stain in #12 Coril Fauve - Another fail on my part, this is my first YSL Glossy Stain. Please pick your stunned jaw up off the ground - it's rude. There are just soooo many lip products out there that I overlooked these, ok? OK???!!! But at least I'm here for the party now, that's what matters. All the reviews are right - these are amazing. A hybrid between a gloss, lipstick and stain - they feel great on the lips, wear beautifully and stay on forever. Need I say more? I'm guessing no because you probably already have one. 3. Zoya Nail Polish Remover - Never thought I would see the day when a nail polish remover made my monthly favorites, but it has. The day has come. And once again, all of you were right. I have been reading about this remover for eons and finally picked one up. One swipe on my nails and it instantly blew every other nail polish remover out of the water. Late to the Zoya party, but now I'm here. 4. Sunday Riley Artemis Hydroactive Cellular Face Oil* - Oh, another Sunday Riley product makes it to my favorites list? You betcha. This cult classic serum is an absolute essential in my skincare regimen, and when they sent me this face oil to try, I had a sneaking suspicion I would love. Whatta ya know? I did. Designed for combination and problematic skin, it helps to balance, detoxify, clarify and tone the skin. Whew, just saying it is exhausting but it delivers on its promise. The scent is quite strong, but dissipates after just a few minutes. Sunday Riley products are known to give you a glow, and this oil is no exception. My skin is radiant after only using for a few weeks. And that's the goal isn't it?? Yes, it is. 6. Hourglass Ambient Powder Brush - Yes, this was a splurge but I don't regret even one penny of this brush purchase. I use to apply most of my finishing powders since it can be turned sideways and used for great contouring or use full on to get a broader application. The hair is incredibly soft and deposits just enough color. It took me a long time to decide if I should get this brush, and after one use I was sad I hadn't purchased sooner. I love the Glossy Stains and I love the color you have. 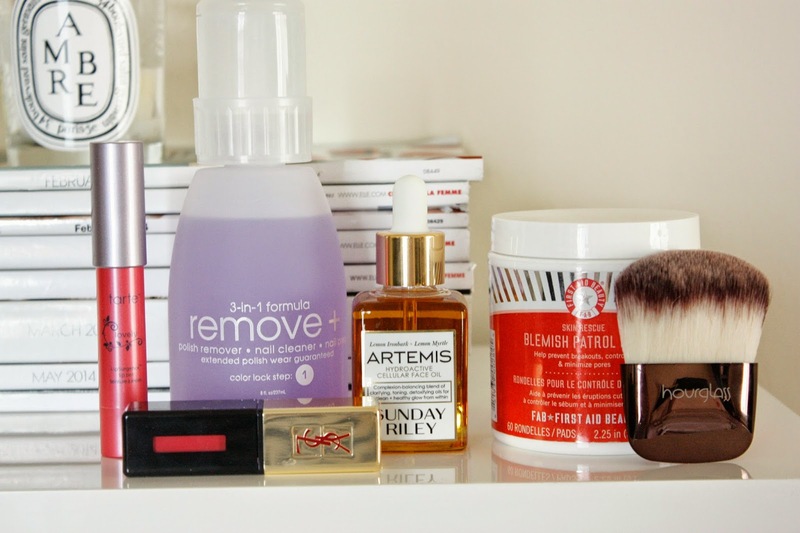 Plus, almost everything I have tried from First Aid Beauty is holy grail for me! Great favorites! I actually prefer the It over Babydoll my all time favorite mascara.